Recently, the town I live in, Truckee, CA updated their Truckee.com website. 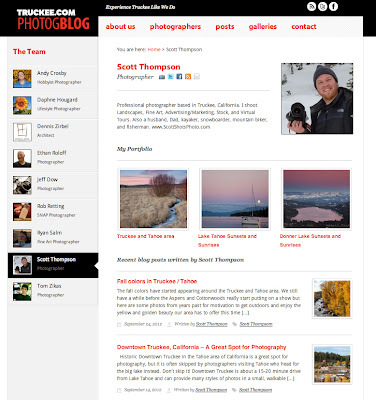 They licensed a few of my images for the new website but they also invited me to be a featured photographer on their Truckee PhotogBlog. The blog also contains posts and photos from other local photographers. The new site and the new blog have recently gone live and I have now made a couple posts to the blog. Please check it out and let me know what you think, comments in the PhotogBlog are very much appreciated. 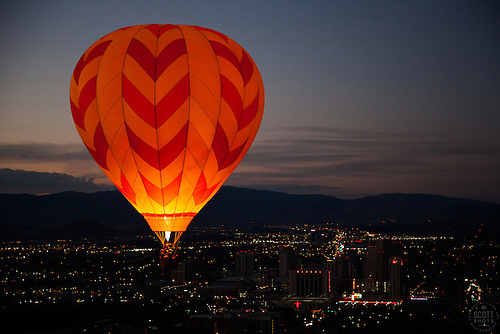 "Dawn Patrol 15" - Photograph of a glowing hot air balloon flying for the Dawn Patrol at the 2012 Great Reno Balloon Race. Photographed from a hot air balloon. 2012 Great Reno Balloon Race. Photographed from a hot air balloon. 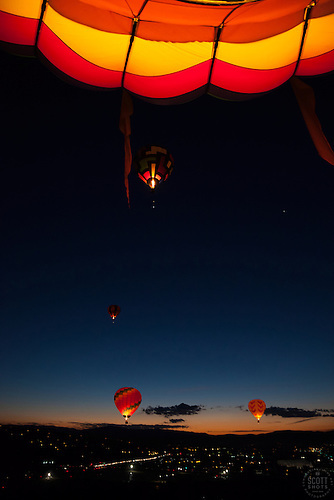 I recently had the incredible experience of photographing the 2012 Great Reno Balloon Race Dawn Patrol from a hot air balloon. It was one of those moments in my life where I had to pinch myself to make sure I wasn't dreaming, well, the 2:30 am alarm clock buzz may have contributed to that feeling. It's a long story how I scored the spot in the balloon but it has to do with the Dawn Patrol team using one of my images I got of them last year for a poster they were signing and selling for charity. I was actually supposed to fly during media day a couple days earlier but the high winds made it unsafe to fly. So my pilot asked if I wanted to try again for Dawn Patrol, "Of course!" The low light and moving balloon were a huge challenge for photography but I was able to pull it off. Please enjoy this slide show of images below and let me know what you think in the comments. Thank you. All of the Great Reno Balloon Race images above are available as large fine art prints, photo gift items, and to license and download right now. Click on an individual image for more info.